An interview with the indomitable author, Brenna Kate Simonds! Welcome! Abby: What is your book title, and when will it be available? 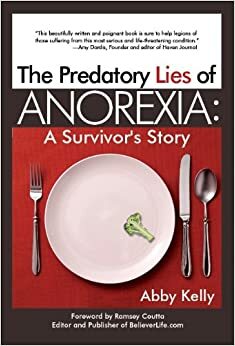 It’s been released on Kindle. The paperback release will be in late January. A: What is one word that sums up this book…Why? BK: Freedom! What freedom is and how it plays out in the life of a Christian is one of the most misunderstood topics in Christianity. But Jesus died so that we can experience true freedom, and it’s worth taking the time to discern what that might look like in our lives. A: Is this your first book? If so, what was the inspiration that led you to begin this project? And if you’ve written others, what are they? BK: This is the first full-length book I’ve written myself. I’ve been involved in a few other projects in the past. I began to compile this book for the ministry I direct and while gathering the material, I felt God saying that this book was for a broader audience. It’s certainly been a labor of love, but I trust God will use it as He sees fit. A: Who is your intended audience and what do you hope your readers take away from your work? BK: My intended audience is everyone! One of my biggest fans is not even a Christian. I really think anyone could gain something from Learning to Walk in Freedom. It’s for people whose heart’s cry is telling them that there is more to life than they have experienced thus far. A: What was the hardest part of writing this story? What brought you the most joy? BK: One of the more difficult pieces of writing this was sharing my story so publicly. The book is not centered around the details of my story, but I do share it at the end to give readers context. It’s all stuff I have written before and even spoken publicly, but putting it in print for all eternity is a different story! But the same thing has brought me the most joy. I already know from the times I’ve shared both my story and these five freedom steps, this is God’s story and He is using it to impact lives. If I can help one person with my transparency, then it’s all worth it. A: Who has inspired you most in your writing career? Personally? Professionally? BK: I was mentored by Mike Olejarz; he also wrote the foreword of Learning to Walk in Freedom. Mike began pouring his life into mine when I attended the campus ministry he directed in Boston. Even beyond our years of serving side by side, Mike has taken an active interest in my development and in me in general! He’s a fantastic man of God, and I pray I can influence as many people in my life as he has. My husband and I find ourselves quoting him on a regular basis! I have a long list of unofficial mentors, some of whom I’ve met, some I’ve only emailed, and some with whom I’ve never spoken. I’ll list them in no particular order: Nick Fatato, John Ortberg, Russell Willingham, Gary Thomas, Joyce Meyer, Charles Stanley, Richard Foster, and Bob Hamp. Banana Cake! Kind of sounds like Brenna Kate, doesn’t it? I don’t have preferred attire. Whatever I’m wearing at the time is fine, but I have a preferred beverage. Coffee!!! Mostly decaf. I’m high-energy enough as it is. Coffee! I drink it black. I do try and alternate it with herbal tea. Though I’m originally from New England, I have to say Starbucks. Their coffee is just better. Their food is, too! I have to pick one? This is far too difficult a question. But I’ll try. I’d have to say Russell Willingham. His concept of core beliefs is one I’ve shared more than any other concept. It’s why I asked him to read my book and possibly endorse it (if he liked it – which he thankfully did!). I can’t wait to see what else he has to say in future writings. Gary Thomas is a close second. I always give his book Sacred Marriage to newlyweds, and his book Sacred Influence to struggling wives. Thanks for being with us, Brenna! Best of luck on your book! 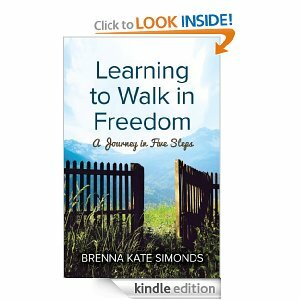 If you’d like to purchase Brenna’s book, the e-version is available on Amazon now: Learning to Walk in Freedom: A Journey in Five Steps. If you want to pre-order a paperback copy of Brenna’s book, you can do that here: Pre-order!